Tilney St. Lawrence postmill stood near the Buck Inn. The red brick mill tower had staggered windows and the ogee cap had a gallery and a petticoat and at the top was a ball finial. Two pairs of French burr stones were powered by one pair of double shuttered and one pair of single shuttered patent sails. The sails were turned to wind by a six bladed fan. A MESSUAGE with a Wind Corn Mill and Appurtenances and Two Acres of good Pasture Land adjoining or near the same i Tilney St. Lawrence near Lynn, now in the occupation of John Bilton at £17 a Year on Lease, about a Year and a Half of which is unexpired. The above is Freehold, hath an unlimited Right of Common in Marshland Smeeth (containing about 2000 Acres of rich Pasture Land) and pays 14s. yearly to the Land Tax. Enquire of Mr. Thomas Case, Attorney at Lynn. Petition of Bankruptcy filed 5 June, 1854, against William Bennett, of Tilney Saint Lawrence, Co. of Norfolk, Miller. To surrender 15 June at the Court of Bankruptcy, Basinghall Street, London. To be sold by Auction by C. C. Goddard at the Buck in Tilney Wednesday 28 June 1854 at 5 o'c. A good dwelling house with Baking Office and two large ovens, stables, cart lodge, granaries, piggeries and other outbuildings to the same belonging. And Also an excellent Wind Corn Mill, well fitted with new stones and other necessary apparatus and 6a. (more or less) of arable and pasture land adjoining to the above late in the occupation of William Bennett. The buildings are in excellent repair and well situated for trade. Apply JARVIS & SON, Solrs. Lynn. Announced to take place on the 12th inst. 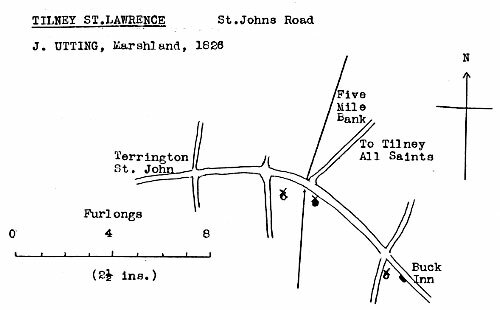 The Sale by Auction of a Mill, Bake house, land and Cottages in the occupation of Mr. Richard Southwell and others at Tilney St. Lawrence WILL NOT TAKE PLACE, the same having been sold by private treaty.